Doomsday Clock Stays At 3 Minutes To Midnight : The Two-Way Despite the progress represented by the Iran nuclear deal, rising tensions between the U.S. and Russia, North Korea's nuclear tests and other conflicts mean the world is still close to catastrophe. The Doomsday Clock stayed fixed at three minutes to midnight — the closest it has been to midnight since 1984. The Doomsday Clock remains unchanged this year, at three minutes to midnight. 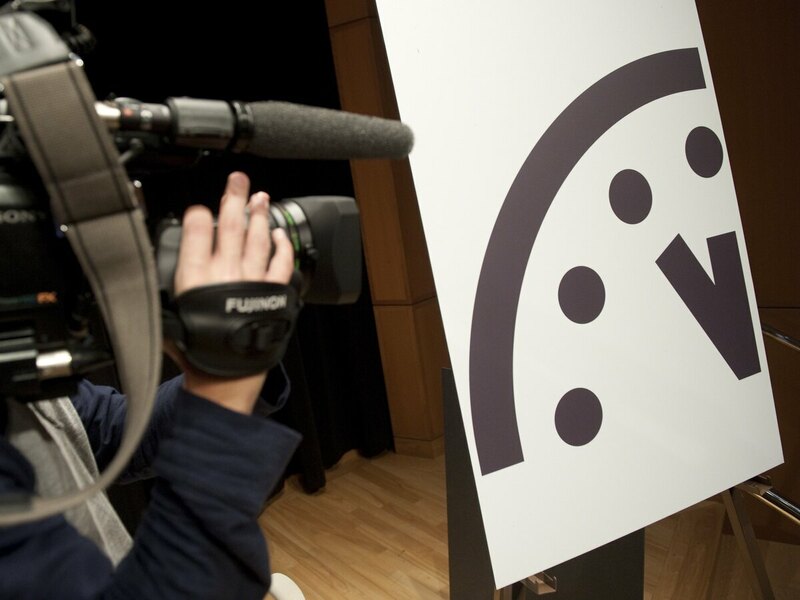 Managed by the Bulletin of the Atomic Scientists, the clock symbolizes how close humanity is to destroying itself, with midnight representing global apocalyptic disaster. Despite the progress represented by the Iran nuclear deal and the Paris climate summit, the BAS says rising tensions between the U.S. and Russia, conflicts in Syria and Ukraine, North Korea's recent nuclear test, as well as nuclear modernization by a number of countries, including the U.S., has offset the positive work achieved in the past year. As a result, the clock — which was moved up two minutes to 11:57 p.m. last year — will remain at the closest it's been to midnight since 1984, when the Cold War was at its iciest. "Three minutes [to midnight] is too close. Far too close," the organization said in a statement. "We, the members of the Science and Security Board of the Bulletin of the Atomic Scientists, want to be clear about our decision not to move the hands of the Doomsday Clock in 2016: That decision is not good news, but an expression of dismay that world leaders continue to fail to focus their efforts and the world's attention on reducing the extreme danger posed by nuclear weapons and climate change." The BAS was created in 1945 by scientists who helped develop the atomic bomb during the Manhattan Project. Two years later, following the bombings of Hiroshima and Nagasaki, the BAS designed the Doomsday Clock to alert the public to the dangers of nuclear proliferation. When the clock started running, it was set at seven minutes to midnight. The closest the Doomdsay Clock got to midnight was in 1953, when the U.S. and the Soviet Union both tested hydrogen bombs. That year, the clock was set at two minutes to midnight. Over the years, the clock has been moved forward and backward to reflect changes and improvements in the world's ability to prevent nuclear proliferation and work to mitigate climate change. For example, in 1960, the clock was moved back to seven minutes to midnight, thanks in large part to new cooperation between the U.S. and Soviet Union. An interactive timeline of the clock's shifts can be found here on the BAS website.